Surya Nepal Asha Social entrepreneurship Award 2013 Finalist, Madhukar KC invented anti-smoke “Matribhumi Chulo” after 13 years of his research and experiments. 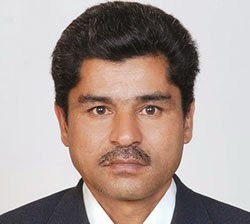 Madhukar KC from Pyuthan has been working in energy field since many years. After completing his SLC , he went to work in India like many other people in his village. However, he returned Nepal and started his research . As traditional wood fire stoves is used to cook food in the village,enormous amount of smoke used to pollute air at home. Madhukar KC thought to invent something new from which smoke would not be released while cooking food. One day, he saw a goldsmith making jewellery. He was very fascinated by the technique used by goldsmith. A air used to flow from a pipe along with the fire to melt gold. Madhukar KC used the same idea for stove to create improved air flow system with less smoke. After years of his experiment and research, he succeed. He participated in many exhibition seminars in search of a suitable market for his invention especially out of valley districts. Every year he improvised his invention to make it better and better. He started getting very motivating and positive feedback. He got support of UNDP to experiment his invention at Lele, Lalitpur. He did research at Lele among 1000 household to use Matribhumi Chulo instead of gas stove and fire wood stove. That research and experiment turned out very positive. The result showed that women were very happy and satisfied to use such an efficient stove to cook food with the benefit of no smoke and fast cooking period. 90% use of firewood was reduced and 50% gas was saved after using Martibhumi Chulo. He faced many challenges during the period of his invention till now. 13 years of struggle was not a easy path for him. Like all youths in the village, he was forced to go abroad for employment. He went to India and worked there few years but then he returned Nepal to do something on his own. He had to walk alone in his journey and neither family nor society supported him. However, he managed to follow his dream and able to payback from his struggle. 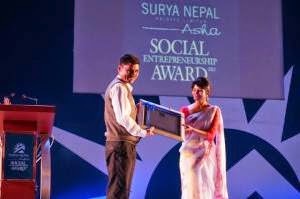 He received Surya Nepal Asha Social Entrepreneurship Award 2013 organized by Change Fusion Nepal. He was one of the top 5 finalist among 119 applicants for the award. This recognition has encouraged him to work with more enthusiasm. He says," I am very happy to get this award and the support from people. Finally,my work has been appreciated and people have started to recognize me and my work." He also got fund from the award which he planned to use in his project for research. According to Madhukar KC, the only motivating figure to start his venture was his science teacher in Pyuthan, Geheraj Sharma. His teacher motivated him to never give up what he is aiming for. Many national and international investors are interested in his project. His future plan is to reach international markets creating employment opportunities and export Nepali products world widely along with his two partners Bijaya Raj Ghimire and Chaitya Bhahadur Nakarmi. He estimates to create employment opportunities to almost 10,000 men and women. In long run,he aims to make Matribhumi Chulo as an alternative to gas. +Alina Prajapati is a management student doing her bachelor's degree . She is a project leader at +View your Choice and also a passionate singer.